The worst recessions in history have all followed excessive investment in housing, personal transportation and the stock market. Today, the US is hitting two out of three. Take a look at the auto sales graph below. 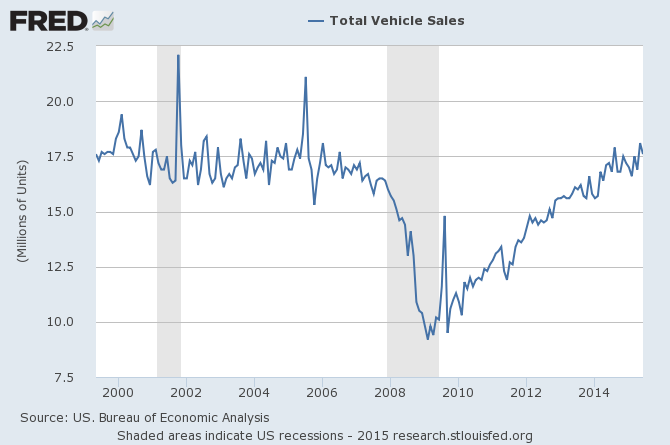 US sales have reached pre-recession levels. You can see one of the reasons for the high sales volume in the next chart. Interest rates on auto loans are lower today than during the crisis. 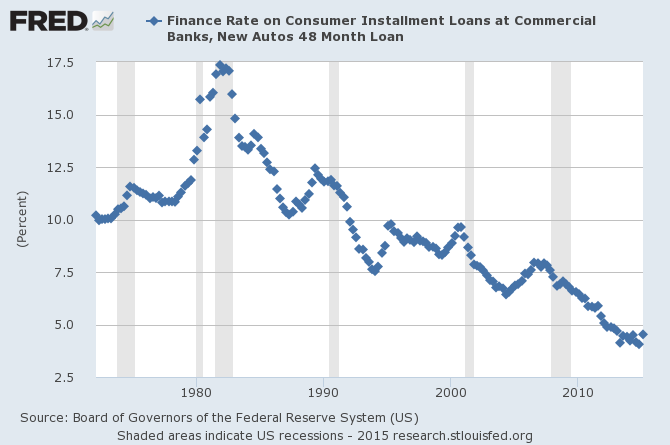 Auto loans seem to have replaced lagging real estate loans for banks. Washington Irving, author of great fiction such as The Legend of Sleepy Hollow, was also a good economist. In the early 1800s he wrote in his essay “The Mississippi Bubble” about a boom and bust that took place in France a century before. In that crisis, the introduction of paper money had inflated the money supply and caused excessive spending on real estate, carriages and the stock market. Then the devastating bust came. The massive depression of the early 1870’s that overwhelmed Europe and the US involved mainly real estate and the stock market, but included carriages. The roaring twenties that preceded the Great Depression consisted primarily of investments in real estate, spending on consumer durables such as autos and refrigerators, and the stock market. Not every recession has followed excessive investment in the big three – real estate, personal transportation and stocks - but the worst ones, those with massive bank failures, did. According to the Austrian business-cycle theory (ABCT), excessive investment in capital goods industries, at the same time that consumers increase spending, characterizes the expansion phase of the business cycle. The bust occurs when the consumer spending part triggers the Ricardo Effect. From our point of view these figures suffer from the defect that they exclude durable consumers' goods.... The latter group of cases includes, of course, not only a great many durable consumers' goods but also all durable producers' goods. That passage comes from pages 210-211 of Pure Theory of Capital in the chapter explaining the behavior of durable goods as capital goods. Hayek had constructed a graph from another economist's data showing the life spans for capital goods in order to make a point about the shape of the curve. Clearly, Hayek thought consumer durables should have been included in the data. ...for it is usually taken for granted that the yield of capital goods in general will move parallel with, or at least in the same direction as, expected final demand. Now this is true enough of capital goods (or rather durable consumers' goods) which without any further collaboration from labour will directly serve consumption. A “general glut” [of savings] in consequence of too ample a supply of means for investment cannot occur so long as there are still unused opportunities for investment which offer a positive rate of interest. And even if the demand for capital in the form of new productive equipment were not very elastic, the demand for durable consumer goods is practically inexhaustible. Let us examine briefly the two most popular varieties of these disproportionality doctrines [errors about the business cycle]. There is first the durable goods doctrine. These goods retain their serviceableness for some time. As long as their life period lasts, the buyer who has acquired a piece abstains from replacing it by the purchase of a new one. Thus, once all people have made their purchases, the demand for new products dwindles. Business becomes bad. A revival is possible only when, after the lapse of some time, the old houses, cars, refrigerators, and the like are worn out, and their owners must buy new ones. In the ABCT, capital goods have always included durable goods and consumer durables as part of the durable goods sector. 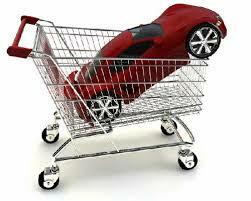 So followers of the ABCT need to pay attention to auto sales as harbingers of malinvestment in capital goods.